I walk along the road which it stopped raining. Road is consisted of 20 short poems. This one is written about life. he might come to realize whch road is better for him. I hope that each road will be abundant for each person. This is the first volume consisting in 22 short poems. This book was writen about daily’s notice of life. there are many roads as well as people’s personalities. will see a new way when you really know what you want. Each road is waiting for you. Each road tell me how important walk step by step. 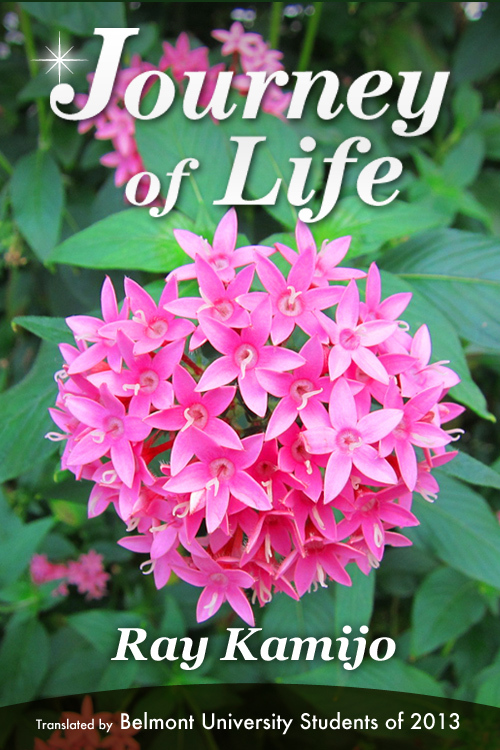 “Journey of Life” is composed of 11 original poems by Ray Kamijo. These poems are written in both English and Japanese. will be published with English versions made by the students every year. They tried to translate Japanese into English with their heart. 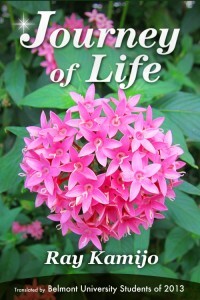 hope that readers will find some hints about life through this book. Many hydrangeas were in full bloom this year, too. Blue flowers are shining just like a blue sky. I can see good words and sentences. I try to make sure what authors want to convey their intentions. we might find new world and spread something which I couldn’t have seen before. It’s important to respect my own idea. On the other hand, I should understand what people think. I feel alive and energetic much more just like flowers! Small flowers come into bud. They have same colors and sprout at the same time. They know the good time to put out together. It will be soon to be in full bloom. I’m working with some staff making a team. They sometimes make me realize my weak points which I haven’t noticed before. but now they teach me how to stop and control to succeed some dreams. I face to face my personality and essential qualities by working with them. Time will come when something starts. others’ minds and thoughts more than before. I found that every experience connects with learning of writing. known as the God who presides over marriages. which are chirping through a year. A Buddhist priest lectures visitors to the shrine for about 30 minutes. When I listen to his lecture, I feel relieved and safe. He urges the necessity of gratitude of daily life. Big success and delight will start from a tiny one step. I could realize simple life is the most important thing for a success.